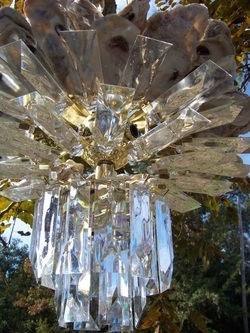 This chandelier with crystals measures 1.5 feet across and 15" in height. Weighs 12 lbs prior to packing. Takes 6 x 40 Watt Bulbs. This chandelier is resourced. The Oyster shells have been treated with bleach and Detergent and are crispy wihite. The Oyster shells were harvested in Pass Christian, Mississippi.